Live IVR Design to Make Feel Customers Special! Caller will receive an announcement when call is answered. Message in the announcement can be set in 3 ways - Voice, Text to Speech and API call by Webhook. During the call the option of key press is open to navigate to target place. Example: Press 1 for Sales, Press 2 for Accounts etc. 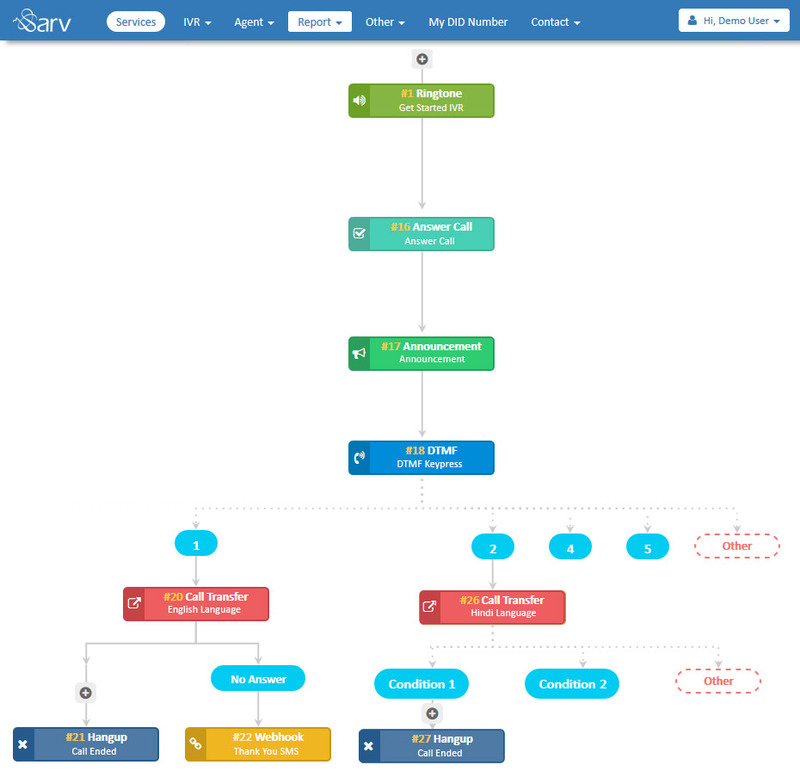 The APIs which are integrated with the system to send data to server and receive the data from server whenever required. you can ask for long inputs. It can be fixed length or key based termination. When you set “fixed length” you need to enter the input limit and In “key based termination” select a termination key. During the call is running, webhooks can be used to fetch the data which can further be used while call is running. It is a type of announcement which is executed before the call is answered. It inherits certain features of announcement as well like TTS, webhook etc. System generates a call to customer and a call to your agent. And now your agent and customer can communicate with each other. 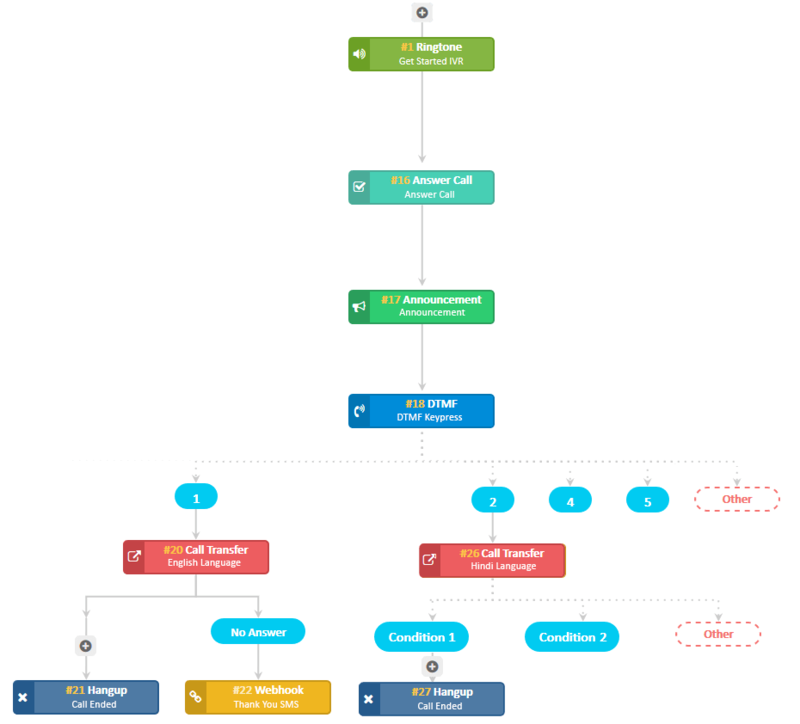 During the flow of complete IVR, decide the point where you need to answer the call. Decide the modules you want to use before or after the call is answered. Every individual customers seeks personalized attention. It is also necessary for all vendors to make their customers feel special by greeting them for example their Name. This is the best way to earn loyalty and regular visits from them. Record all your incoming/inbound and outgoing/outbound calls. Live calls recordings can be paused, resumed and even stored to listen anytime to ensure the quality standards. Call Transferring/forwarding is potential for people who are busy focusing on their business and need to have their phones professionally managed and routed to available professional.Transfer Your Live Calls using our module. You can write relevant detailed notes. This information can be helpful in future. You can create color tags for a specific activity which will remind you the actions need to take. Do not bore your customers while your executive is busy on another call. Music on Hold will activate a waiting music while on hold. Addition of this tool made the overall process much quicker wherein one can simply type and convert the text into a voice recording and you are all set to use it. Type your content in text block and record the message to be played in your campaign. 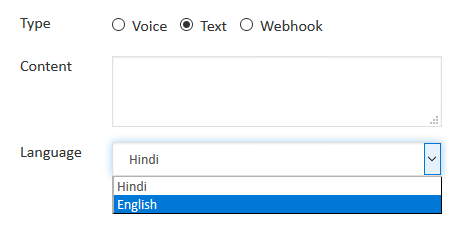 You can choose the language either English or Hindi with male or female voice audio.